– to discover the customer’s true intentions during this visit to their bricks and mortar location. They might decide to stick close to the customer to secure the sale or walk away with assurances to the customer that they’re not too far if they do have any questions. It’s quite different when the customer’s browsing an online store and retailers can’t pick up those exact same cues, but that’s not to say there aren’t any clues that can help to interpret customer intent. 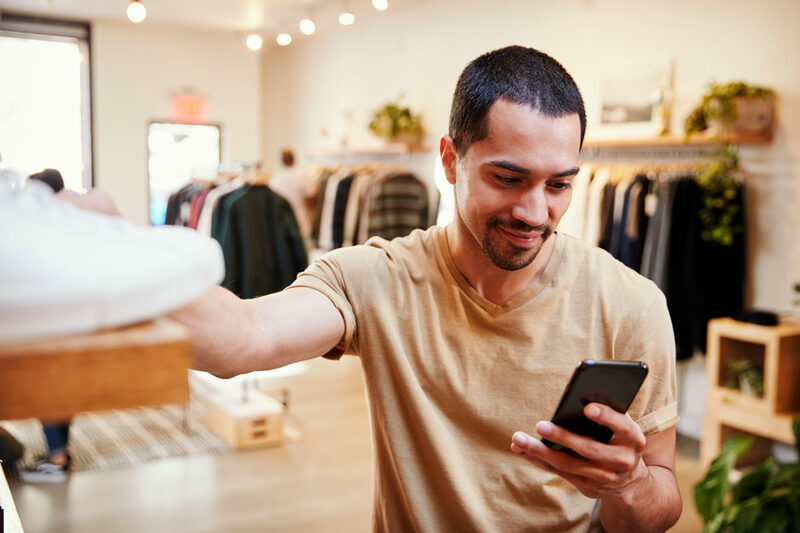 For logged-in customers with rich profile data to mine, a retailer could use demographic information in order to smooth out the customer experience. They’d be able to craft an experience for that customer because there are precedents from similar customers that can be used as a foundation. However, demographics alone aren’t enough. The retailer must understand each customer’s intent, so that experiences can be curated differently. In the example below, both customers are logged in and the retailers know from their profiles that they are both male, 20-25, and have California Postal Codes, but that’s essentially where their similarities end. They act very differently upon logging in. – Logged In and navigated to ‘Sale’ Shopping out of habit, Adam may be looking to round out his wardrobe with some specific pieces but only if he finds them on sale. Adam seems to know exactly what he wants and may not need additional incentive in order to purchase. The discounted merchandise incents him to add to cart and proceed to checkout. He also doesn’t seem to need any help/interference and is appreciative of the self-service nature of shopping online. – Logged in and navigated to ‘Look Book S/S 2019’ Brandon appears to be looking for inspiration for the season. Unlike Adam, he didn’t sort by price and check availability in his size. Since Brandon is looking for inspiration ahead of next season, price and availability aren’t considerations for him yet. He may appreciate product recommendations and help from curated content and messages – ‘Brandon, you might enjoy this combination’, ‘Did you know that we have hassle-free returns?’, ‘Don’t forget that we offer complimentary tailoring’. Besides these helpful interventions, Brandon may also appreciate an offer for 3% return on his current purchase that he can use towards his next purchase. Adam’s beeline towards Sale items was smooth, without distraction and he was able to make the quick self-serve purchase he wanted. Brandon’s purposeful browsing for inspiration was helped by the timely interventions and he was also primed for a future purchase with a reward. Yes, both were ‘just looking’ but had personalized frictionless experiences that converted them from browsers into buyers, because the Retailer understood their intentions from the clues they presented as they browsed. Talk to us about what we do to understand customer intent and how we’ve been able to use it for our clients’ benefit! You can also check out ES Engage, and see how Individualized Offers have enabled our clients to respond to their customers’ intent, while protecting margins, optimizing promotional spend and increasing e-commerce profitability. Responding to Customer Intent Wins! Why wait until customers abandon cart?